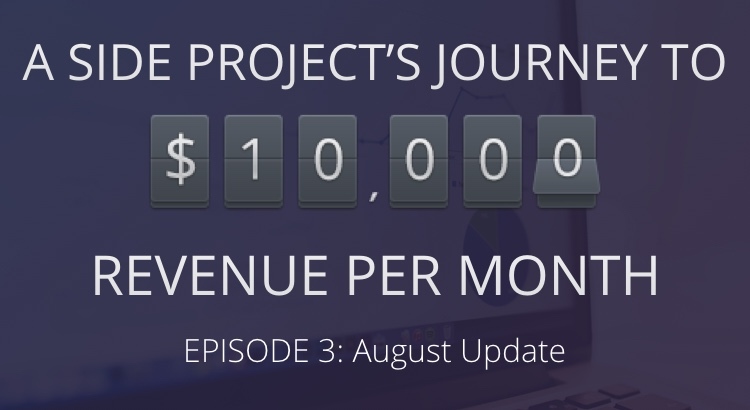 Last month’s revenue was $1,425, which was a 111% increase on the previous month’s. So we were confident that revenue would increase again this month. We set the goal of $1,600 for the month of August and we achieved it! Not quite as dramatic an increase as July but are pleased the result, which equates to an 18% increase. Page sessions are up from 2,225 to 8,688. You are probably wondering why there are over 4,400 sessions on August 28th while the rest of the days average between 200 to 300. This huge bump is the result of an experiment Ad.fly. Adf.ly redirects people after clicking to watch or download something for free online, and is a way for bloggers and service providers to monetise their site. After hearing about this service, we thought it could be a an easy way to get cheap traffic to the site. Adf.ly charged just $6 in exchange for 5,000 unique visitors which is obviously insanely cheap. So although we didn’t expect much, it was intriguing and worth a shot. If even 1 visitor out of 5,000 made a purchase or enquiry it would be well worth the $6 investment. As Adf.ly promised, the site received 5,000 visitors. What we didn’t expect was that all of the visitors would be sent to the site within 2 hours. As the screenshot shows, all of the visitors came between 4:00 PM and 6:00 PM on the same day. Of course most of these visitors left the site immediately, leaving us with a bounce rate of over 97% for the day. The traffic wasn’t targeted so most visitors have probably never heard of Snapchat. Also the majority of visitors were from countries such as Brazil where geofilters aren’t available. So from a marketing and CRO perspective, it didn’t have much of a chance. However it was interesting to see the results and for the incredibly cheap price it was worth a try. There were 7 blog posts in total during August. 1 week was missed on the Snapchat Influencer Q&A but we did have some great interviews with Ashely Kruempel and Austin Iuliano. Also towards the end of the month, a new series where we show some of our favourite geofilters from that week. The idea behind the series is to give readers some design inspiration for their own geofilters and show off the work of our designers. This month we launched our business packages with it’s own landing page. We originally started Custom Filterz after realising the potential that geofilters can have for small businesses. After working with numerous businesses on geofilter campaigns for exhibitions and conferences, we wanted to extend the services that Custom Filterz offers to include marketing campaigns, consultancy and strategic planning. The goal for September feels very ambitious so it’s a motivating challenge! The competition continues to increase and Instagram just released their stories feature so time will tell if they will affect Snapchat’s growth and usage. August was a successful month and it was good to finally start targeting businesses more directly.